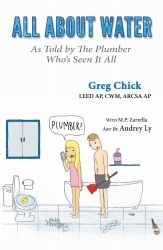 The Second Edition of "All About Water - As Told by The Plumber Who’s Seen It All" © by Greg Chick, Illustrated by Audrey Ly and Co-Authored by M.P. Zarrella releases today. Ramona California’s Greg Chick, a LEED-AP plumber and water advocate with over 40 years experience as a licensed contractor, tells the complete story of water through two fictional characters. There is nothing in the marketplace today like this timely and relevant book. Sacramento, CA, February 02, 2018 --(PR.com)-- Ramona California’s Greg Chick, a LEED-AP plumber and water advocate with over 40 years experience as a licensed contractor, tells the complete story of water through two fictional characters, cousins named Mike and Mac Ro. Mac and his wife Jane care about Planet Earth, they are advocates for nature. They do their best to educate Mike and Goldie who love the fast life and creature comforts and could care less about conservation and sustainability. Illustrator Audrey Ly, a recent honors graduate of San Diego State University with a degree in Multimedia, brings every concept to life with vibrant story-telling art. There is nothing in the marketplace today like this timely and relevant book.